When you receive an AllCells fresh product, please count the cells imme­diately upon receipt. Before any further manipulation, cryopreserved products should be counted immediately after thawing. AllCells is not liable for any cell loss during subsequent processing or manipulation. Proper aseptic technique and personal protective equipment should always be used when handling cell products. Mix the cell suspension thoroughly and to disperse any cell clumps to ensure even distribution of the cells. For fresh cell products shipped in a transfer bag, use both hands to pick up the transfer bag by the top and bottom edges and invert the bag side to side (approximately 1 second for each rotation) for 5 total rotations to mix. Wipe the transfer line with an alcohol swab. Make sure the line is clamped before cutting the line with sterilized scissors. After the line has been cut, unclamp the line and dispense a 2-3mL aliquot of the cell product into a sterile tube. Mix the cells in the tube by inverting 3-5 times or if cell lumps are present, pipette up and down at least 5 times with a P1000 pipetman. Immediately transfer 50-100μL aliquot of the cell product into a fresh tube for dilution prior to counting. Dilute the test sample with the appropriate volume of DPBS to target approximately 2M cells/mL and mix thoroughly. Our apheresis product (LP, FR, Full) contains approximately 1 x 10^10 total nucleated cells in about 250mL. The estimated cell concentration is 4 x 10^7 cells/mL (1 x 10^10 cells/250mL). A 20-fold dilution (50μL sample + 950μL DPBS) will result in a test sample of approximately 2 x 10^6 cells/mL. The final dilution factor is 40 (20 x2) after 1:1 dilution with 0.4% trypan blue for counting. For all other containers, mix the cells by gently pipetting 25-50% of the cell suspension up and down at least 5 times using an appropriately sized pipettor or serological pipette. For whole fresh bone marrow product shipped in a bottle, a 4-10 fold dilution of the test sample with DPBS before addition of trypan blue and counting is recommended. Based on our target cell number and fill sizes, no additional dilution for our other fresh cell products is needed; however, an optional additional dilution of test samples from our 25, 100 and 300M fill sizes with DPBS before proceeding to Step 5 may facilitate counting. Immediately take a 10μL aliquot of the cell product from the vial/tube after mixing. Combine 10μL of the diluted/undiluted test sample with 10μL 0.4% trypan blue. The test sample should be counted within 5 minutes after mixing with trypan blue. Load the hemacytometer with approximately 10μL of the trypan blue-labeled sample. Make sure the entire chamber is filled with the test sample. Under bright field, dead cells appear light to dark blue while viable cells appear clear to autofluorescent (Figure 1). Count all the viable cells in a quadrant (Figure 2). To achieve better accuracy, ≥ 100 viable cells should be counted. More than one quadrant may need to be counted to achieve ≥ 100 viable cells counted. Count the dead cells in the same quadrants. Calculations to determine the cell concentration and percent viability. Follow the AllCells procedure for thawing cells. After the cell product is completely thawed, invert the vial 5 times to mix the cells and immediately transfer a 20μL aliquot of the cell product into a microcentrifuge tube. For product unit sizes containing 1M cells or less, follow Steps 5-11 as instructed for counting Fresh Cell products. If the unit size of the cell product is >1M cells, dilute the test sample by slowly adding (around one drop per second) an appropriate volume of cold (2-8 0†C) DPBS to target approximately 2M cells/mL concentration. Our LP, CR, MNC, 10M product contains no less than 10 x 10^6 total viable nucleated cells in 1.8mL. The estimated cell concentration is ≥ 5.6 x 10^6 cells/mL (≥ 10 x 10^6 cells/1.8mL). A 3-fold dilution (20μL sample + 40μL DPBS) will result in a test sample of approximately ≥ 1.87 x 10^6 cells/mL. The final dilution factor is 6 (3 x 2) after 1:1 dilution with 0.4% trypan blue for counting. Gently mix the diluted test sample and follow Steps 5-11 as instructed for counting Fresh Cell products. Figure 1. Differentiation of live and dead cells using trypan blue dye exclusion. 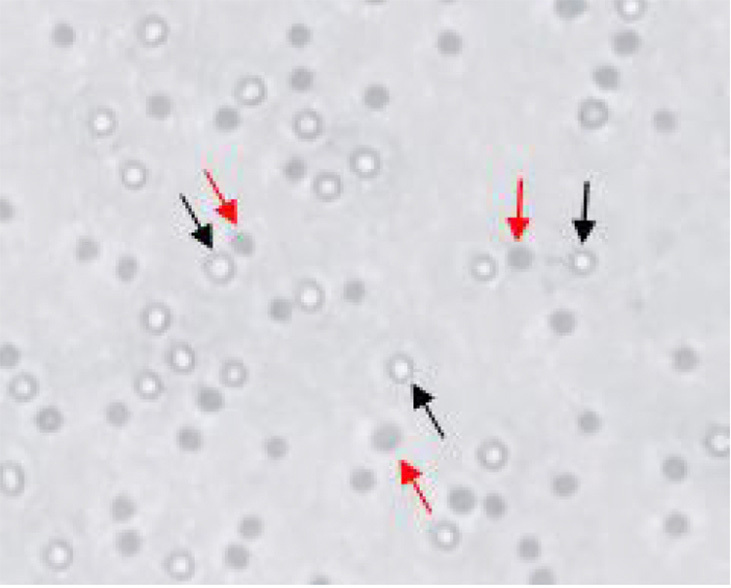 Black arrows indicate live cells and red arrows indicate dead cells stained with dye. Figure 2. Hemacytometer with Neubauer gradients (from http://www.hausserscientific.com/). 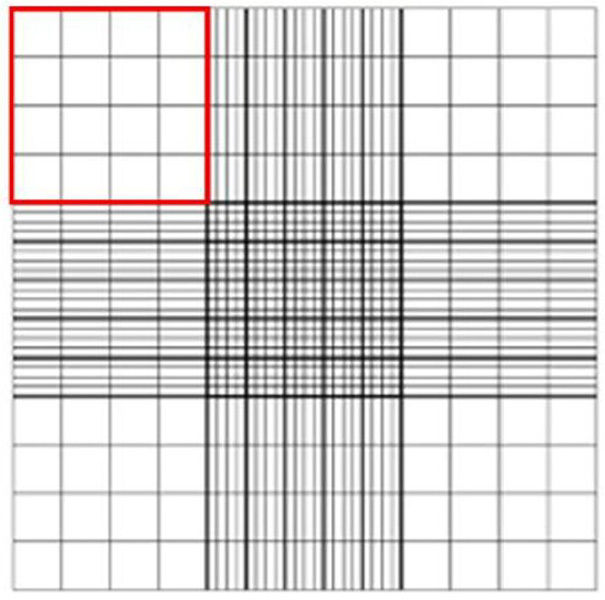 A counting quadrant is highlighted in red outline.